Free Printable April 2017 Calendar. Need a Free Printable April 2017 Calendar? Here you can find a free printable calendar for the school, college, non-profit organization community, church, office, or for home. Don’t spend your money in expensive blank calendars for 2017 just print it free here. 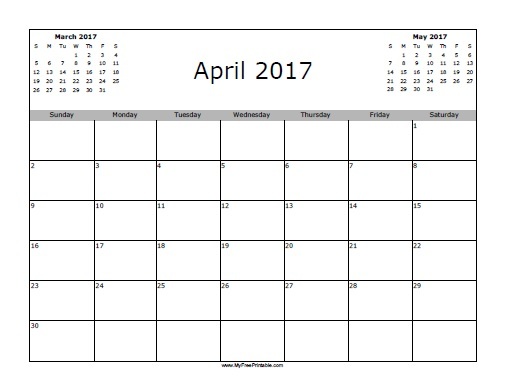 Print the free April 2017 calendar using a inkjet or laser printer and write down all that you have to do this month April 2017. Don’t miss important days like birthdays, anniversary, a job interview, tasks, church, due date, school goals, activities, phone calls to do, things to do and more. Calendar includes previous month March and next month May. Select from the free printable April 2017 calendar starting the week on Monday or Sunday.